You must make reservations at least 5 minutes in advance of the time at Flame Pizzeria. Flame Pizzeria is an upscale wood-fired pizzeria featuring Neapolitan pizza. The pizzas are baked in a 700 degree stone oven in full view of all guests. Merrill Shindler of "The Daily News" calls Flame "the best pizza in the Valley." The Los Angeles Times says Flame Pizzeria is "the best pizza in Los Angeles" and Eater LA states, "Flame Pizzeria is in the top 20 restaurants in all of The San Fernando Valley." Great food, delicious craft beers, a master sommelier-chosen wine selection, matched with impeccable service and a warm inviting ambiance is what the award winning chef/owner strives for every evening. 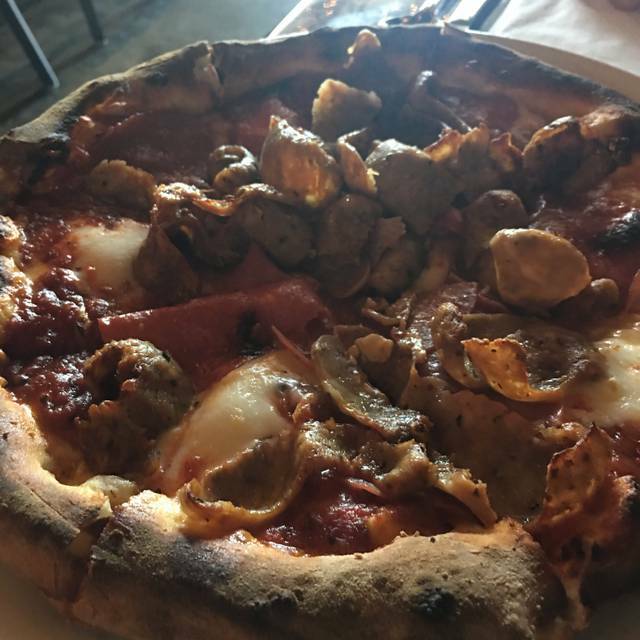 GREAT pizza - our favorite is the Blanco with marinara sauce added. I rarely drink beer but I make an exception for the Mango Hefeveisen at Flame. On the Value Rating: They said that we could substitute one topping on our pizza, but charged us for both - the ingredient that we left off AND the ingredient that we substituted. Not nice. The Resteraunt is a quaint small neighborhood pizzeria. Menu is small, primarily pizza with a few apps. I thought the apps were pricy for what you got. The ceasar salad was excellent, pizza was fabulous, our server Nono was very friendly and never let our drinks get low, and our party of 7 had a good time. Looking forward to going back. The food is always consistent and the service friendly and attentive. Highly recommended. Excellent service. Primer menu by the Chef. Outstanding ! We introduced some friends to the restaurant. They loved it. The sliders are excellent. The best pizza in the valley. Salads and cake are all amazing. Pizza is great. Don’t expect your normal North America fast food versions. It’s quality pizza. Apps are small and in the expensive side. It was flames! I would absolutely recommend Flame to friends and family alike. Fantastic experience from start to finish. Tony, the host, was a big reason for our great experience. He greeted us with genuine, positive energy and even got us started with water. He then made sure we were taken care of with our drink and salad order since our server was busy with a large party. Once our server took over, she was wonderful as well. The food was so good! My wife and I are both pizza and beer “snobs” but this place hit the mark on both! Richard, the owner and chef, even came over to our table to welcome us and see how we enjoyed our meal. We highly recommended this place and we will definitely be back! Wonderful service! When we walked in they had our table reserved. Food was great, loved the thousand layer potatoes. Pizza was great too although we ordered two that were fairly similar, would probably switch it up next time. Cute little gem in an unassuming location. The arugula salad was outstanding. Could have eaten a second one! the 2 pizzas were delicious. Highly recommend for a delicious, casual pizza and salad dinner. The owner Richard is the star of the show. What a class act. Creates a super warm atmosphere where good food, comfort and customer service are obviously paramount. It was my first time there and I definitely will be back. Wonderful Delicious Experience As Usual!! We LOVE this place!! The food and amibience at Flame Pizzeria was exceptional. The pizza’s are handcrafted and served hot fresh from the wood burning oven, which is manned by the owner and head chef. The host and servers were friendly and on top of things. The restaurant is warmly lit with string lights and the seating areas are cozy and intimate. I would highly recommend this restaurant to anyone and will definitely be back . Flame is great. Open Table (OT) not so much. Tried to get a reservation for 7 at 7pm OT said nothing available for 2 1/2 hours. I called got a reservation from the owner Richard. I told Richard I was told by OT that there was nothing available. Richard called OT and was told that OT messed up and I would get 1,000 points for the screw-up. I did not get the points. If I was not a regular at Flame, Richard and Flame might have missed out on a large party. My wife and I have been going there for a few years now and we have never been disappointed. The food is delicious and more importantly always consistent. 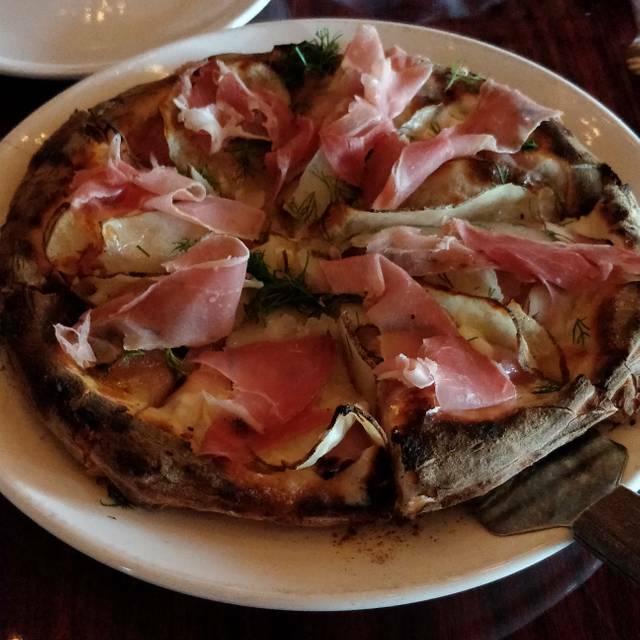 From the Thousand Layer Potatoes and amazing Caesar Salad with the house made dressing and seasoned croutons to the wonderfully fresh Pizzas, named after family members, the Lily, Lindsey, Nana and Richie ! Great place for any occasion and very nicely priced. I've eaten here several times, after being told about Flame by a friend. I've since introduced it to friends of mine. 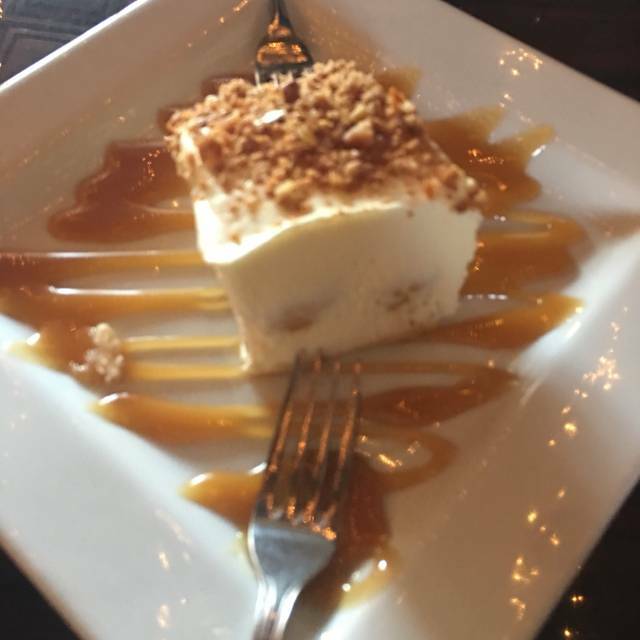 All the food is great, the beer selection is relatively small but covers a good range, and the one dessert they serve is to die for...amazing! Flame is the kind of place where you feel comfortable hanging out, taking your time eating and enjoying another drink or two after eating as you chat with whoever you're with, unrushed with nobody hassling you to head out so they can turn over the table. The staff are casual, friendly and efficient. Richard makes killer pizzas...the dough is delicious and fired-up in his impressive oven to pure perfection. I am very, very, very fussy about my pizzas. I've had them in Italy, France, Spain, New York, Chicago, San Francisco, and elsewhere. Certainly there are different styles in different places but, simply put, Richard's pizzas are as good as any! I need to add that he is also a super guy...very affable, passionate about what he does, friendly to all, and very chill (and has great music taste...I always love his Pandora selection)! So, if you have not tried Flame, you owe it to yourself to do so. Who would have thought that one could find pizzas of this quality, in a little strip mall in Reseda, from a chef as good as this gent?! By the way, the oven-roasted veggies and the baked thin layers of potato and cheese are great to start with. May Flame's fires keep burning! The best pizza not just in the valley, but among the best in LA -- authentic, amazing crusts, great ingreadients, handmade -- just excellent all around. The food is delicious, the staff is friendly, and I will return. If you enjoy craft beer and handmade pizza this is the place. I also liked the fact the noise level was low enough that we could have a conversation. Nice little place food was good. Even thou it lists pizza do not think it has pasta because it does not. Good app's and pizza. Limited menu, which I like not 10 pages of basically the same thing. Was on the tv shoe Burrows Bite's on KTLA. We live in Valencia and would make the drive back there again. Read about Flame and wanted to try it. Took my son there Sunday night. The pizza oven dominates the restaurant. The chicken starter was great, and the pizza was one of the best I've had. Wow! I couldn't recommend Flame Pizzeria more to anyone looking for some of the best pizza they've eaten in their lives. The pizza is what drew us there, as we'd read a number of reviews noting how spectacular it is, but what will bring us back are the people. Every single member of the staff with whom we interacted was friendly, warm, and most important, happy to be there. It was so delightful to spend an hour in a restaurant with people who are just in a great mood. It speaks volumes about the culture and atmosphere cultivated by the owner, Richard, who also proved himself to be a warm and gracious host. The pizza lived up to the hype - We tried the Richie and the Lindsey, and there wasn't a bad bite in the bunch. We also tried a couple of starters, the Thousand Layer Potatoes and the Lemon Garlic Chicken, both of which could have served as entrees on their own, and both of which were delicious. We're very much looking forward to our next visit to Flame Pizzeria! The best pizza we’ve had in years, great service, and the owner/chef is wonderful ! Great Pizza and the Potato appetizer is out of this world!!!! This is hands down the best pizza not only in the valley but southern california. Only wish this place was open for lunch, too! We love this place! We recently moved nearby and it's our favorite neighborhood spot. Really great food, great staff, amazing vibes! It's always so much fun and DELICIOUS to visit Flame. The staff is so friendly and efficient - they always make you feel welcome and comfortable. The food is to die for. Richard's wood oven pizzas are the best ANYWHERE. If you haven't visited Flame, go and see what you've been missing! We love this neighborhood Gem. Our favorite place in the Valley. What a wonderful experience! Amazing food, wonderful vibe, we'll be back soon. By far, the best pizza in the West San Fernando Valley. I love the crust. All the toppings are well-crafted. Nothing is greasy. Try the mushrooms-best ever! We also enjoy the craft beer selection. Great neighborhood place.